And that’s exactly what this book is, a response to your SOS when you get stuck on a section of that painted canvas driving you nuts. The front and back cover are plastic coated cardboard for durability. The book has 35 pages of stitches, usually one on each side of the paper, so you have nearly 70 stitches diagrammed for you inside. Plus there is an introduction and an explanation of tent stitch, continental stitch and basketweave. Each stitch in the “Stitches” section is diagrammed at the top of the page in a gray scale diagram, perfect for those who have vision problems. All the stitches are numbered so you can follow the steps involved, and a few have two diagrams to further explain the stitch. The true value of the book is in the text under each stitch diagram. Carole talks about the best path to take to create the stitch, the threads she thinks work especially well for that particular stitch, explains where she has used it, and often reveals variations that will make the stitch extra special. I’m sure most of us have used Mosaic Stitch at one time or another. But Carole explains that stitching Mosaic Stitch in diagonal row is the easiest way to get an even tension and helps you figure out compensation. She talks about using Mosaic to shade and how it lends itself to architectural stitches. All great information, and this is just one stitch of many. If you are new to embellishing painted canvases, this book is going to be your new Best Friend. It is jammed full of great ideas that are not going to be hard to execute. I suggest that you read this several times, letting all the great information sink in, then carry it around to pull out whenever you get stuck. A quick flip through the diagrams is sure to find something that will work, whether you are trying to find a perfect stitch for fur, windows, water, clothing, backgrounds or anything else you will find on a painted canvas. 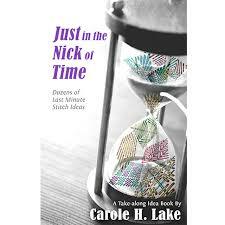 A really experienced stitcher will probably know most of what Carole talks about, but most of us are regular stitchers, not experts, and if you don’t have someone like Carole in your stitching group, this little book is going to come to your rescue again and again, just In The Nick of Time. And if you are an expert stitcher, Carole has come up with a few things I’ve never heard of. It’s a cozy little book to settle down with and read, just for fun. I’m betting whatever your level of needlepoint expertise, you’ll want to revisit this little book again and again for inspiration.